Fountain Hills High School is excited to offer 3D Animation as a signature program. 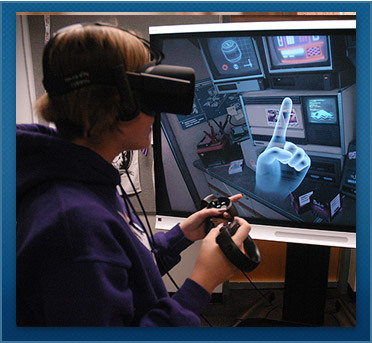 This technology-based program offers students an opportunity to prepare for careers in the following areas: digital animator, game designer, character animator, interactive media designer, modeling, texturing, animation, rigging, dynamic effects, environmental design, visual effects, scientific illustration, architectural visualization, interior design visualization, product prototype visualization, training simulation, and courtroom re-enactment visualization. This four-year program is offered in partnership with EVIT, the East Valley Institute of Technology. Students will take two years of coursework at FHHS and two years of coursework at EVIT. We are proud to announce that EVIT now has a satellite campus in Fountain Hills to make attending even more convenient for our students. Students in this program will bring creative ideas to life by combining traditional artistic skills and design techniques to develop projects in 3D animation, visual effects, and games. They will develop skills in environmental and character modeling, texturing, lighting, rigging, animation, and more using industry standard software such as Maya, Zbrush, Adobe After Effects, and others. During their junior year, EVIT will provide training in the 3D software and prepare students to create animation for a variety of content areas. Their senior year focuses on character development, digital sculpting, and 3d printing, as well as compositing, dynamics, and animation history. All work in the program is added to a professional portfolio that students can use to demonstrate their skills for future endeavors. Students may have the opportunity to work with clients and participate in internships or externships to build strong industry resumes and credentials. Interested students and families are encouraged to come tour the facility and see the technology in action. We are always available for a tour, please call us at (480) 664.5511 to set up your tour today.